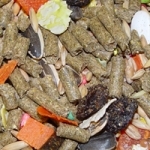 The premier fortified gourmet rabbit diet that is loaded with more natural goodies than anything on the market! You’ll be impressed by not only the premium quality of the ingredients but the quantity of select natural treats. 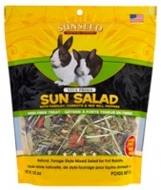 Sunburst for Rabbits has alfalfa pellets, sunflower, oats, wheat, barley, shelled peanuts, safflower, pumpkin seed, flaked peas, flaked carrots, flaked beans, flaked corn, raisins, bananas, pineapple, and papaya.